I finished out last week with a series of recipes centered around a theme: similar ingredients, similar procedure, different end result. And, once I thought up a theme, my mind went into overdrive and came up with many, many others. So from now on, I’ll be presenting breads with a common theme for each week. I think it’ll be easier to read, easier to follow, and certainly easier to pick recipes! This week, I give you: Breakfast Breads. One thing breakfast breads usually have in common is that they’re a little faster and easier to throw together than your standard loaf. The reason is obvious: who wants to fuss over some complicated concoction when you first wake up, only to wait four hours for it? One exception that comes to mind here is croissants, those ethereal creatures that are purely a labor of love; and a labor they are, but so worth it! And no, I will not be making croissants this week. I do have a recipe for croissants that I’m dying to make, but it will have to come later in the year. I spent this last weekend at the home of my boyfriend’s uncle and aunt, who very graciously escorted us throughout their hometown, revealing hidden gems in a highly underrated Midwestern city. I made this recipe to bring as a small host/hostess gift, unglamorously but functionally presented in a gallon-sized ziploc. The name, Scottish Morning Rolls, is new to me; but the form and flavor are reminiscent of English muffins (unsurprisingly, given the name). One difference between the two is that these are shaped individually into rolls, whereas English muffins are cut out of one rolled-out piece of dough. The texture of Scottish Morning rolls is also a bit denser, not-quite-exactly but more like a bagel. 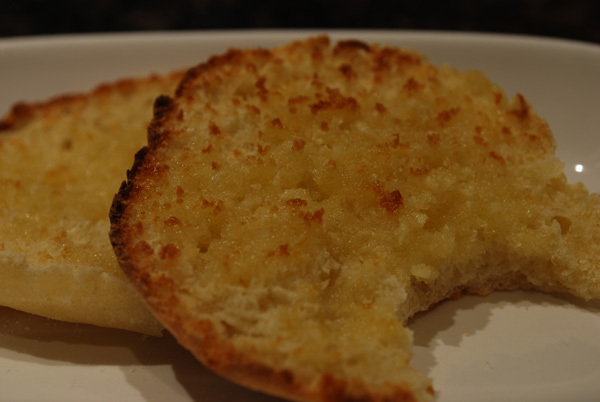 They are not quite as sour as English muffins, either, but they do retain a similar softness. Yes, they do need a little while to rise, but they bake quickly due to their small size, and don’t need to rest long after baking. Sliced and toasted with butter, accompanying soft scrambled eggs and salty bacon, they made a perfect lazy Sunday brunch. 1. Lightly grease a large baking sheet (or line with parchment). 2. Sprinkle the yeast over the milk, and stir until dissolved. Let stand 5 or 10 minutes, or until foamy. 3. Sift or whisk the flour and salt together in a large bowl, and make a well in the center. Pour yeast mixture and water into center of the flour, and mix to a soft dough. 4. Knead lightly in the bowl (dough will not be smooth), cover with plastic wrap, and leave to rise in a warm place for about 1 hour, or until doubled in bulk. 5. Turn out onto a lightly floured surface and punch down lightly. Divide evenly into 10 pieces. Covering the others, knead each piece briefly. 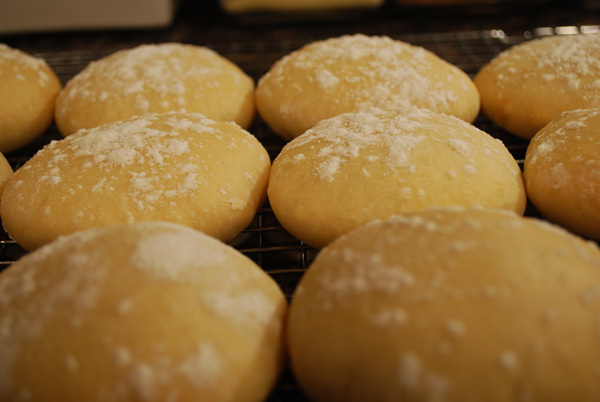 With a rolling pin, roll each to a flat oval, about 4×3 inches. 6. Place rounds onto prepared baking sheet, well-spaced. Cover and let rise in a warm place for 30 minutes. 7. Meanwhile, preheat oven to 400 degrees F. Lightly press down on top of each roll to equalize air bubbles and to prevent blistering. 8. Brush with remaining 2 tablespoons milk and dust with flour. Bake for 15-20 minutes, or until light brown on edges. Cool about five minutes on a rack, and serve warm. 1. I divided mine into 12 slightly-smaller rolls, only because I have a hard time dividing half a lump of dough into five pieces. Whatever works for you! 2. After kneading lightly in the bowl (step 4), my dough was very shaggy, and not at all smooth and together. I figured I’d done it wrong, but thought I’d see what happened. Turned out that the liquid soaked into the flour perfectly, and the dough was lovely and soft after rising. 3. I didn’t press on the rolls (step 7), and they turned out just fine. Maybe my yeast is getting a little old, but they didn’t form any large bubbles that would’ve blistered. If you see any, then it might be a good idea to follow that step. It is apparently traditional to shape them like that, despite the fact that any finger-imprints are lost in baking. 4. If you plan on splitting and toasting them like an English muffin, I suggest underbaking them slightly. They are lovely to pull apart and eat as is, but the shape just seems to suggest that sort of treatment. These are ideal for freezing in a ziploc (split them first), and popping straight into the toaster for a quick breakfast. Easy!